Who was Sequoyah and why was this Native Indian leader famous? Summary: Sequoyah (c. 1765-1843) a Cherokee Native American who created an alphabet of 86 syllables for the Cherokee language in the early 19th century. 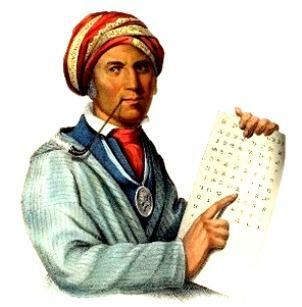 Sequoyah is the only person known to have invented a whole alphabet, which he used to record the history of his tribe. The Cherokee Native Indians used the alphabet to communicate in writing, Sequoyah had a Cherokee mother and European father. The sequoia giant redwood trees of California are named after him. The following fact sheet contains interesting facts, background history and information about the life of Sequoyah and the events in history that led to his fame as a great Native American Indian leader.